This website is non-profit; scratch that--it's negative-profit. 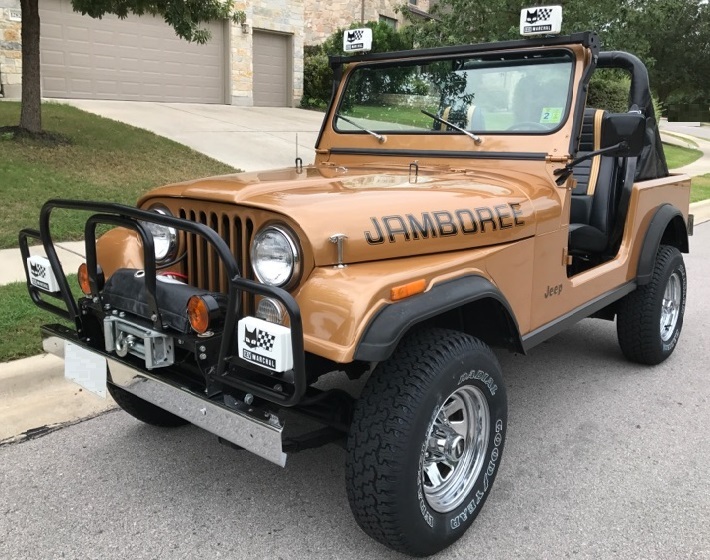 It was developed to (1) let others know about the 1982 Jeep CJ-7 Jamboree Commemorative Edition, the rarest CJ-7 ever built and one of the rarest Jeeps of all time, (2) provide information to owners to help them restore and preserve their Jambos, and (3) pass on general information about 1976-1986 CJs. 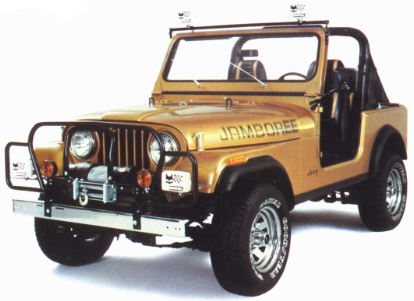 Jeep planned to produce 2500 Jambos, but only made about 630 (560 Topaz Gold Metallic and 70 Olympic White). To learn more click here. The Olympic White Jambo was not planned from the start. It was added late in the production run and only 70 units were built. This makes the elusive Olympic White Jambo one of the rarest Jeeps ever produced. To learn more click here. Jeep made a few Jambos with the TorqueFlite 999 Automatic transmission. We believe they made about 11 Olympic White factory-automatic Jambos. This is the rarest production Jeep ever made. You can read about that here. The first group of Jambos were all Topaz Gold Metaillic and were batch built during the first three weeks of March 1982. We refer to this group as the "Gold Group." Beginning in mid-April 1982, Jeep allowed Olympic White as a paint option. We refer to this group as the "Mixed Group." The Mixed Group production ended in late June 1982, along with the 1982 model year. The Gold Group included about 412 Jambos and badge numbers #0031-#0450. The Mixed Group included about 216 Jambos (63% Topaz Gold and 37% Olympic White) and badge numbers #0001-#0030 & #0450-#0702. We know of #0751, but believe it was either speically numbered for rebadged. Badge numbers #0001-#0030 were not the first Jambos made. Rather, these Jambos were made in April, after the intial run of over 400 Jambos. The exception to this seems to be #0012, which was around the 200th Jambo made. Jeep likely saved the low numbers for special people. AMC followed the same strategy in the numbering of the AMX. You can read about that here. Jeep claimed the Jambos would be serially numbered. This was not quite true. While numbering does tend to increase with sequential serial number, the Gold Group Jambos were more or less numbered randomly between #0031 and #0444. The Mixed Group was more or less sequentially numbered through about #0675. Jambos between #0676 and #0702 seem to have been specially numbered. You can read more about that here. Jeep produced Jambo badges with numbers through #2500. The Jambo Registry holds a NOS badge with #2237. They also seem to have made duplicate badges because we have NOS badge #0101 and also Jambo #0101. We do not know what happened to all the extra badges, but suspect they were destroyed. If they had not been destroyed, we believe we would seem many more of them for sale. You can read about that here. Jeep skipped Jambo badge numbers. We think they skipped about 70 numbers in the Mixed Group. This skipping seems to have occured between batches. We suspect that Jeep pulled a group of badges for production. If any badges were left over after a production run they did not always make it back into the stock of badges. Rather, they were likely stolen from the factory. This happened with the AMX. The fact that Jeep skipped numbers is why we have Jambos through #0702, but still estimate Jeep only made 630 Jambos. You can read about that here. The chrome portion of the Jambo dash plaque was produced by Ford. It is actually the XLT emblem from the 1980 Ford Bronco! You can read about that here. Jambo rocker moldings are supposed to be black, not clear aluminum or bright. What today look like bright rockers are actually faded black anodize. This issue is true of other 1982-1986 CJs. We believe all CJs during this time came with black rockers. You can read about that here. For years, people have believed that Jeep introduced moveable window vents (wind wings) in 1983. Actually, Jeep planned to introduce them in 1982, but they did not appear until around serial number 062000. This would have been in late May or early June of 1982, which is right near the end of the 1982 model year. This means that Jambos above serial number 06200 could have a dash pad with thin ends. You can read about that here. Jeep excluded air conditioning the Jambo because this required relocating the ashtary to the location where the Jambo badge went. We believe the initial run of Jambos did not have AC, but that Jeep allowed it in Jambos above #0450. You can read about that here. The Jambo was supposed to come with the AMC 20 rear axle and 2.73 gears with a locking differential (Trac-Loc). However, we now know that some Jambos came with a 2.73 open differential, while others got 3.31 Trac-Loc. 3.31 gears were standard on CJs produced for sale in high-altitude areas. You can read more about this here. Jambos were not supposed to come with factory-installed radios, but some did. However, for the most part, Jambo radios seemed to have been dealer installed (or they were installed by another shop). In these cases, the antenna placement was highly variable. The CJ antenna (all CJs, not just Jambos) is supposed to be installed on the passenger side just behind the fender and below the cowl. However, the template Jeep provided to place the antenna was printed incorrectly. You can read about that here and you can also download our corrected template. You have to be very careful when repainting a Topaz Gold Metallic Jambo--or, likely, any metallic-paint CJ. The paint formulas have drifted substantially over 35 years and most manufacturers produce a paint that is too gold. We conducted an extensive study of paints and have identified BASF 2H as the only option for Jambo restorations. You can read more about that here. You also have to watch out when repainting an Olympic White Jambo (or CJ). Just like with Topaz Gold Metallic, the paint formulas have drifted over time and most off-the-shelf 9B formulas are off. Our study of 9B paint shows that PPG Shopline/Omni is the closest match. It is nearly a perfect match to the original. You can read more about that here. This website was developed and is maintained by Eric Bickel of Austin, Texas. Eric is a professor at The University of Texas and a Jeep nut. Why did Eric create this website? Because creating it had higher quality than not creating it. If you don't know what that means, read Zen and the Art of Motorcycle Maintenance. 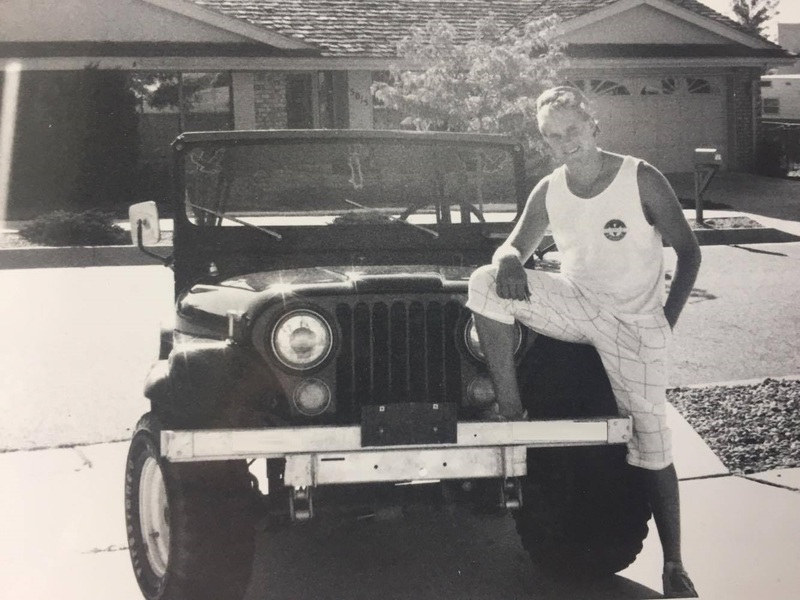 Eric's first Jeep was a 1975 Raven Black CJ-5, which he rebuilt and modified during high school. This CJ had a 258 ci that was bored 30 over, the head ported and polished, and had an Isky racing cam, Offenhauser intake (6=8), Holly four barrel, and Hedman headers. On the interior, it had racing seats, five-point seat belts, a La Cara steering wheel, a full cage. The second worst mistake Eric made was allowing his brother to paint this Jeep red, when Eric went to away to graduate school at Stanford University. The worst mistake was later selling this Jeep. The last known location of Eric's Jeep was Albuquerque, New Mexico. He now owns Jambo #0152 and #0693. Eric's daily driver is a 2014 Billet Silver 300 SRT 392 Hemi (470-hp). Only 496 300 SRTs were sold in the USA in 2014. Eric's is 1 of only 24 2014 Billet Silver 300 SRT's. You can find production numbers here and and color breakdown here. Eric can be contacted via email at jambo152@82jambo.com. Many people have contributed to this site since it was launched in 2006. Capt. Pete (original owner of #0555) helped Eric learn about the Jambo at the very start, provided a copy of his window sticker, answered many questions, and sold Eric his Jambo tire cover and OEM spare tire. Tom Timbario (former owner of #0418) found many Jambos in the registry, corrected many mistakes, and kept the flame alive while Eric was away for several years. Daniel de Baca (Dano', #0319 and #0355) made many contributions to this site and to Jambo owners, including spearheading the Jambo reproduction tire cover. Eric and Dano' are from the same town and both like to kick back with some New Mexico green chile (not chili). Heath Aggen (#0180) is a Texas buddy and also a new and active contributor to the site. Abram Lane (future Jambo owner who is also from New Mexico and attending NMSU, like Eric) found an archived several Jambos while Eric was away. Jim Allen is a 4x4 historian and a friend of The Jambo Registry. Jim provided the Production Direction Letters, which defined the Jambo specs! Finally, the site would not be possible at all if it were not for the Jambo owners themselves. Thank you for sharing information and pictures of your Jambos. Together, we have been able to prove that the Jambo is one of the rarest and coolest Jeeps of all time! To register your Jambo, please send an email to jambo152@82jambo.com. Please include pictures of the Jambo (exterior and interior), a picture of the dash plaque, and a picture of the VIN tag (on the firewall). We will compare this tag to our VIN database of known Jambos.